It’s not easy to accept the void created when someone you have known for decades may no longer know you, when their memory fades into an abyss and their reality is anything but real. There are many diseases and medical conditions that we fear: a diagnosis of cancer, heart attack, stroke and many more of course. Most conditions have at least some treatment or lifestyle management options, however there are exceptions. And one of those “exceptions” is Alzheimer’s. If we’re not already there, we will be very soon. 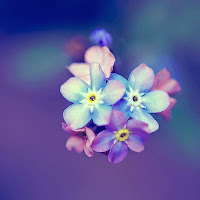 And, being brutally honest, Alzheimer’s is a fatal, progressive, neurological disease from which no one recovers. It’s natural that we grab hold of denial, hoping their memory will get better or at least not worse, all the while wrestling with the gnawing truth that they won’t improve, ever! We try rationalization, logic, reasoning, any and all methods we can employ to preserve their waning essence. Fighting the winless battle of how Alzheimer’s Disease affects our loved one is not only frustrating, it’s futile and wastes precious time better spent engaging in the moment. Like many situations over which we have little or no control, the operative word is Acceptance. We may not be able to stop the moving train of dissolution that Alzheimer’s creates, but we can jump aboard and ride it to the end. It’s tough. I know; I’ve been there. I rambled on and on trying to convince my mom that no one had stealthily snuck into her apartment to steal a roll of stamps - surely misplaced, again – or her black shoes – next to the bed in plain sight – and the coup de grace, a piece of lint! “It was right there,” she snarled, poking the chair armrest over and over. It was a ridiculous waste of time and energy on my part. When I finally experienced the proverbial epiphany, a story so laden with drama and absurdity it would take a chapter in a book to tell (oh wait, I wrote that chapter already in I Will Never Forget) acceptance made all the difference. Mom had Alzheimer’s. There. I said it! And with acceptance came a peace. I could not change the outcome, but I could accompany Mom on her journey and be there every step of the way. I found tapping Mom’s past brought some harmony in her disposition. She smiled when I asked about my grandmother, Mom’s mom, who died when I was six. She shared snippets of her childhood, things I didn’t know, and stories of her brothers and goofy older sister. The shared moments were fleeting sometimes, and truthfully sometimes absent. But on her good days it was delightful to see her calmer and engaged. We still need to advocate for the ones we care about, who can no longer advocate for themselves. We still need to visit, engage, talk to and with, touch, smile, sing to – they won’t notice or care that your voice really should never leave the privacy of your shower or car – connect via every avenue there is with them and often. Denial and ignorance circumvent the truth and just leave frustration in its wake. . Acceptance, however, empowers us into action in enriching and productive ways. 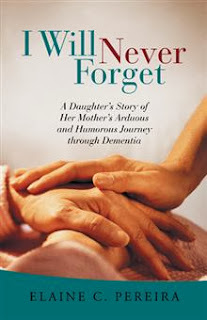 You can read about and learn from all of my unwitting mistakes in my Award Winning and Best Selling memoir I Will Never Forget-A Daughter's Story of Her Mother's Arduous and Humorous Journey Through Dementia.